Navjot Singh Sidhu, the52-year-old former cricketer, commentator and BJP leader quits as a Member of Parliament on Monday. Reports claim that he is set to switch to Arvind Kejriwal’s Aam Aadmi Party (AAP) to play a big role in the Punjab election next year. “The people of Punjab are looking for a change,” Said Mr. Sidhu, just before he resigned from the Rajya Sabha. His exit will hit Punjab’s ruling Akali-BJP combine at a time which is seen to be facing a tough task retaining an upper hand in Punjab after two straight terms, challenged both AAP and a resurgent Congress. He is likely to meet Mr. Kejriwal in Punjab in a couple of days. Mr. Sidhu’s wife Navjot Kaur, a lawmaker in Punjab, is also set to resign, say sources. “If he joins our party, we will welcome him with open arms,” said Bhagwant Mann, an AAP parliamentarian in Punjab. 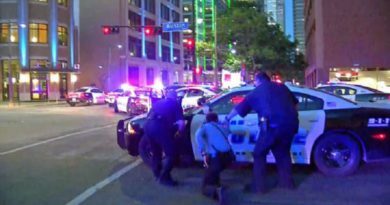 In #America, Four cops Killed, seven injured in #Dallas during shooting Protest.